Leather sofas offer the best of traditional style combined with a touch of mid-century class. Which sofa is right for your room? Read on to find out. A leather sleeper sofa offers a timeless sense of style. No wonder these sofas are one of the most popular pieces of furniture right now. If you are looking for the best leather sofa brands, you’re in the right place. Featuring the very best in high-quality modern leather sofas, our collection is packed with a wide selection of sizes, colors, and styles. 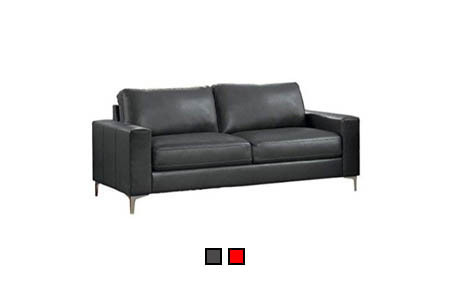 Whether you’re looking for a black leather couch or a brown leather couch, we’ve got all the options you want. Our sofas are easy to maintain, easy to clean, and are very durable. All our leather couches are special design pieces in the following styles: classic, traditional, retro, contemporary, vintage, and more. Check out our expertly crafted leather sofas and find the one that suits your needs. Classic leather sofas should double as both luxury and utility items, and it can be hard to find a sofa that will handle both tasks. Check out the following hand-picked and best-selling leather couches. All are manufactured by some of the best leather sofa brands in the world and each offers both comfort and style in abundance. We’re sure once you’ve browsed our catalog you’ll be able to find the perfect one for your home or office. There are a few features you should consider when choosing a large or small leather sofa for your space. Let’s take a look at those now. Size - Whether it’s a small leather sofa or a three-seater love lounge, size plays an important role when choosing the perfect sofa. Offices often require the formality of one-seat sofas while informal spaces, like homes, look lovely with multi-seaters or a large leather couch to stretch out on. Consider how much space you have available for the sofa. If you have large rooms, smaller sofas might look lost in all that space. And the same holds true for smaller rooms - big couches might be awkward and dominate too much of the room. Style - You can find leather sofas in almost any style you can think of. Choosing the right one for your home will complement your room’s decor. We offer a range of styles including our popular mid century leather sofa. These couches are chic, elegant and look good in any interior design scheme. Take a few minutes to explore our range of fine leather couches and find one that suits your taste. When choosing a sofa, it is important to take the style and design into consideration as it can make or break the decor of your room. Color - Choose the right color to suit your room’s design. Because colors can set the overall tone of a room, you may prefer the best leather sofa you’ve chosen in brown, black, or grey for the office. At home, you can be a little more playful. A popular choice these days is a leather sleeper sofa, these beautiful couches come in all sorts of colors including red, green, yellow and orange. Going for a minimalistic look? A modern white leather sofa adds a touch of cool class to any room. Material - When choosing a leather sofa, the biggest decision you’ll have to make is whether you’d like natural or synthetic leather. You’ll also want to decide if you’d prefer a softer or harder leather, and what finish you would like the leather to have. Each material and finish has its pros and cons in term of maintenance, care, and feel, but ultimately, you can rest easy knowing that each sofa from our collection is made with the highest quality materials and superior craftsmanship. Make your friends jaws drop with this black faux leather sofa, a piece by Baxton Studio, a must have home décor layout accessory. 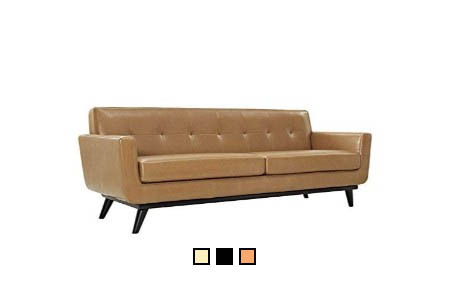 Material: first-class faux leather, discounted modern leather sofa, also makes a really unique décor piece! Finally, this epic black faux leather sofa, manufactured by Best Choice Products, a delightful living room layout accessory. Made of fine faux leather, size: 30"Lx66"Wx30.5"H. Get it cheap, on sale, the best modern leather sofa, lovable and cute. Fine cognac leather sofa, brand: Edloe Finch, model: EF-Z1-3S001. Made with top-level leather, upgrades your style, amazing furniture layout accessory. 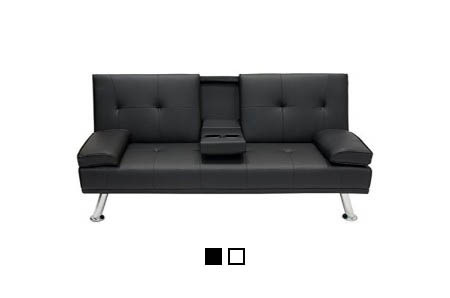 Awesome, check out this fantastic leather sofa, everything you ever needed. Decorative tan leather, by: Modway, model: EEI-1338-TAN. Made with the highest quality of leather, an astonishing living room fashionable piece. The ingenious top-selling 50's leather sofa, it’s an amazing décor item! The highest quality gray leather sofa, manufactured by: Homelegance, upgrades your style, amazing home décor artistic accessory. Made of high quality leather gel. On sale, the best modern leather sofa, fun and affordable. An awesome black faux leather polyurethane sofa, manufactured by DHP, a must have living room brilliant masterpiece. Made with supreme leather. This is the best price for such a classic leather sofa, everything you ever wanted. Rich white leather & suede sofa, produced by Divano Roma furniture, model: EXP-16. Made with top-level leather, customized brilliant leather sofa, a sublime furniture fine accessory. Ingenious invention, looks absolutely amazing and unique! Staggering black leather sofa, brand: Divano Roma Furniture. Get a great deal for this refined leather sofa, a sublime living room brilliant masterpiece, dimensions: 82"Lx35"Wx32"H. You need this in your life! A 70's leather sofa, incredibly fun! Enlivening melrose white leather sofa, manufactured by: Signature Design by Ashley, model: ZB-LESLEY-8090-SOFA-WH-GG. A delightful home décor design piece. Now you can get the best modern leather sofa, super fun and for a reasonable price. Fabulous white leather sofa, made by Casa Andrea Milano, model: EXP11-WHITE. A delightful living room showpiece accessory. Stun your friends completely with this modern leather sofa, this will put a smile on your face in the morning. If you're looking for a really unusual idea, check out this black leather sofa, brand: Modway, a sublime elegant piece. Made with the highest quality of leather. Least expensive cost for such a well designed leather sofa, fun and affordable. Get the most out of this black/dark brown leather sofa, produced by Coaster Home Furnishings. Material: the finest fabric, dimensions: 93"Wx38"Dx34"H. Discounted old school leather sofa, makes a really unique décor piece! Get ready to have the best cognac leather sofa, by: Rivet, a superb home décor masterpiece. Made with the very best leather, dimensions: 82". Now on sale, one of the best modern leather sofas out there, a masterpiece! Get ready for this premium brown leather sofa, made by: Baxton Studio, a sublime living room stylish accessory. Made with the very best leather, dimensions: 31.25"x63.75"x29.25". Get a great deal for this one of a kind leather sofa, exceptional. Showpiece black leather sofa, made by: FDW. Made of prime leather, least expensive cost for such an innovative leather sofa, a must have design upgrade piece. An awesome stylish leather sofa, astounding and remarkable. Gem white leather sofa. Made with the finest leather, cheapest price for a gem leather sofa, nostalgic living room artistic accessory. It's the real deal, unlike any other leather sofas, made with such a unique style, it's completely staggering. Get ready for this top selling saddle brown leather sofa, a piece by Rivet, revives your style, a beautiful home décor enhancement piece. Made of prime materials. An affordable modern leather sofa, a must try for every home décor fan! Prepare yourself for the best white leather sofa, brand: Baxton Studio, a wonderful living room enhancement piece. Made of the finest leather, dimensions: 116.5Lx69Wx32.5H. The best mid-century modern leather sofa, it's completely staggering. The super best dark brown leather sofa, made by: Baxton Furniture Studios, a heavenly modern decor fine accessory. Made with prime leather, dimensions: 29.45LX63.38WX31.59H. The best deal for such a fine leather sofa, cheers! The ingenious top-selling blue vinyl leather sofa, by Modway, a must have living room design piece for every home, including yours! Made of the very best leather. 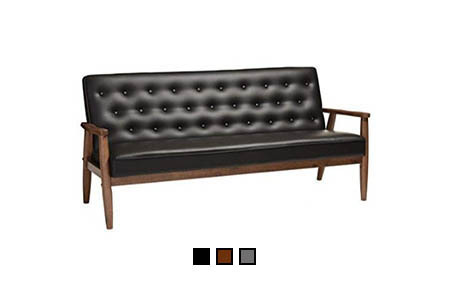 Cheapest price for 50's looking leather sofa, coolest ever! Elegant white faux leather sofa, manufactured by DHP, model: 2051109. material: classic fabric, a delightful home décor design piece, size 69"Wx32"Dx29"H. It's the real deal, blending design and style perfectly into your home. The ingenious top-selling black faux leather sofa, manufactured by: DHP, a must have living room elegant piece. Made of excellent faux leather, dimensions 69"x30"x32.5". Least expensive cost for a classic leather sofa, a great masterpiece. This amazing black leather sofa, brand: Divano Roma, a must have sitting room fashionable piece. Material: fine wood and the best leather. This item received the best reviews for costumed designed leather sofas, a must try! Discover the best gray leather sofa, created by Homelegance, an extraordinary living room masterpiece. Material: the very best leather. Now on discount, one of the best 70's looking leather sofas out there, gigantic! Leather couches and leather sleeper sofas are durable and easy to maintain. Below are a few facts and tips that will make maintaining your leather furniture an easy task. Easy care - There’s a common misconception that leathers are demanding to care for, but that’s because most people don’t know how to. In fact, leather is one of the easiest materials to maintain when it comes to furniture. All you need to do is clean the sofa as needed with a leather detergent and a soft brush. Also, condition your sofa annually to keep the leather soft, supple, and looking good. Lasts long enough, if not forever - Leather is a very durable and hard-working material. There’s a reason why so many antique chairs have original leatherwork still on them, the leather has lasted for decades. If carefully maintained, your leather sofa can be used fora very long time. Cost-effective and natural, leather furniture gets more beautiful over time and usually has high resale value, so it’s a better option in the long run when compared to some other types of furniture material. Care for your new modern leather sofa to make it last as long as possible. To help get you started, we’ve listed a few handy tips for leather sofa care. Dust your sofa frequently with a dry cloth. Try to apply a leather conditioner every six months to keep the leather supple. No matter the color, keep your leather furniture away from direct sunlight. Use specially made leather cleaners. Use a dry cloth when cleaning spills. For further tips and tricks on keeping your leather sofa in prime condition, please check the manufacturer’s instruction on leather care for your particular sofa. The brilliant top-selling classic wood and metal coffee table, made by SONGMICS, a wonderful home décor fine accessory. Made of prime wood and metal, size: 413/4"Lx235/8"Wx177/8"H. Luxury modern coffee table, gigantic! This is a epic faux marble/gold metal coffee table, brand: WE Furniture, refreshes your design, a must have home décor layout accessory. Material: top-level metal. Top of the line new coffee table, looks absolutely amazing and unique! This simple and understated design is the best pine brown wood console table, by Emerald Home Furnishings, upgrades your style, amazing living room stylish accessory. Material: top-notch wood. Customized modern console table, will blow your mind! Jewel led natural wood floor lamp, a piece by Brightech, model: BIJOU-LED. Save money with this fashionable Floor Lamp, a must have home décor brilliant masterpiece. An awesome modern floor lamp, ideal show-stopper! Get ready for the top selling black leather executive chair, made by: Flash Furniture, a cool office décor fine accessory. Material: the very best leather. Get the best price for this bargain modern executive chair, amusing to utilize! If you're looking for a really unusual idea, check out this black lounge chair, manufactured by Baxton Studio, a heavenly living room adornment. Material: the finest wood. Get a great deal for modern lounge chair, incredibly fun and stylish!